Pet Rabbits for Sale: Q and A. Finding a Pet Rabbit that’s Just Right for You doesn’t have to be difficult if you know what questions to ask, what traits to look for, and what critical signs to avoid in a pet rabbit. Q. Where is the best place to obtain a pet rabbit? A. The ideal place to obtain a pet rabbit is from a local breeder of the breed of rabbit that interests you. But, there are several other great ways and places to find a pet rabbit, which we've listed in detail over at Rabbits for Sale. You don't need to shun your local pet shop! A large proportion of the rabbits in pet shops come from breeders of show rabbits. These will be healthy rabbits raised carefully and kindly. Q. Isn't it best to get a rescue rabbit? A. This is a great option, if the rabbit you find is completely healthy, if it has a personality suitable for pethood, and if you can find one that meets your needs. We hear from many pet owners who have enjoyed their rescue rabbits for years. At the same time, the number of people asking us for help finding a pet rabbit lets us know that the "inventory" of rabbits in shelters is typically very low. Overpopulation is a lie. Beware the shelter that has many rabbits suddenly available - there is sadly a chance that those rabbits may have been unlawfully confiscated from a legitimate breeder because of false accusations of abuse, and the breeder may still legally own the animals. Q. My two rabbits just had babies, they are really cute and I've handled them a lot so they'll make really good pets. Can Raising-Rabbits help me sell them? A. Taking care of animals helps children develop empathy, maturity, and responsibility, and is emotionally very healthy. That's why I'm always very happy to hear that people are allowing their pet rabbits to have babies. Unfortunately it is not possible for me to list the many pet rabbits for sale, because it becomes impossible for us to provide an accurate list of available rabbits. The minute your rabbit is sold, I will have five other individuals looking in vain for your rabbit, whereas rabbit breeders typically have rabbits for sale, whether pets, show, or livestock animals, so their listings (on Raising-Rabbits) do not rapidly go "stale." BUT: we DO have a couple options for you, and these involve using our Facebook links. Go to Rabbits for Sale, find the links to the Rabbits for Sale in your State pages, and click through to your state's page. At the bottom of the page you'll find a Facebook comment section. This is where you can offer your bunnies for sale. People in your own state are the ones most likely to be interested in contacting you, and if you live very near several states, feel free to leave your comment on other pages as well. Raising-Rabbits maintains a Facebook presence here. Feel free to offer your rabbit(s) for sale there. Good luck with your selling! Q. Why is one rabbit a 'pet,' but another rabbit in the same litter is a lot more expensive? The various rabbit breeds have become distinct through the concerted efforts of dedicated rabbit breeders working together to create "perfect" specimens of each rabbit breed. Breeders do this by excluding from the breeding program animals that are not acceptable examples of the standard for the breed. 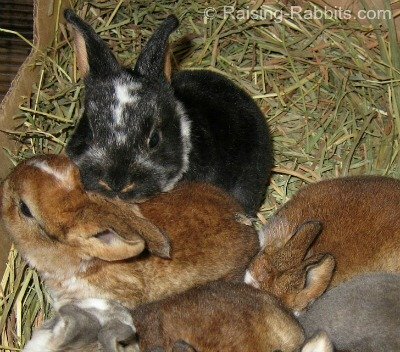 The rabbit that is excluded from the breeding program can still make a wonderful pet. You shouldn't assume a 'pet' rabbit is necessarily 'just pet quality.' I know of a little dutch rabbit that sold as a pet for $10, which then won BEST IN SHOW at a National ARBA Convention. That's a once-in-a-lifetime achievement. It's a rare breeder that makes 100% of his judgment calls perfectly. So if you purchase a 'pet,' and then think maybe you'd like to try your hand at showing, who knows - maybe you'll do better than you think. Are you a Rabbit Breeder with Pet Rabbits for Sale? List your healthy pet rabbits on Raising-Rabbits for free! with a Featured Rabbitry Page. Q. Why are some rabbits runty? A. There are at least three reasons why a rabbit might be runty. It got fewer nutrients in the mother's womb, because it implanted at the far end of the uterus horn. This bunny is born obviously smaller than most of his littermates. And while it will be small and runty in the nest box and as a youngster, there are plenty of "runts" that end up growing to their full genetic potential. It got less milk from the mother because its littermates were bigger and stronger, and commanded more nursing time. This little fellow doesn't gain weight like his siblings, and its tummy isn't as round as the other littermates' tummies. By the time the bunnies hop out of the nestbox, this little runt is just plain smaller than the others. This, like #1 above, is related to nutrients only. If the rabbit was runty because of #1 or #2, chances are he'll do terrific once he hits 3-4 weeks old. At this age, the bunnies start nibbling at the feed. By the time the rabbit is 5-6 months old, there's a chance his weight will have caught up to his siblings' weight. If a rabbit is runty, but his eyes are clear, his coat is smooth and he's inquisitive and energetic, this little guy will still make a wonderful pet. I've been known to keep healthy runts, if they had attributes I thought I needed for the breeding program. He has some kind of a digestive problem, possibly genetic. If the runt has a genetic digestive problem (we're not talking a bout with mild bunny diarrhea), chances are that at 8-10 weeks, the bunny will be very unthrifty--he'll look terrible, with a rough coat, and be hunched in the corner of the cage, or in some similar unhappy condition. This is the rabbit that will NOT make a good pet. Best to let the breeder worry about it. Best if you pick another rabbit out of the litter. Q. I adopted a sick rabbit because I felt sorry for it. Now I'm spending a lot of money on vet bills. 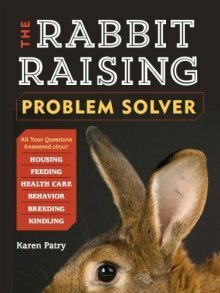 This "Pet Rabbits for Sale" Q&A page was written in order to help rabbit lovers avoid this situation. A. It's commendable to have a kind heart, but please don't feel coerced into sinking your life savings on a rabbit that has no reasonable chance of getting all the way healthy. If you can nurse a rabbit back to health, great. Problem is, there are a few rabbit diseases that are not curable at present. You're in for a very long haul if you choose to adopt a rabbit that will not ever get truly healthy, perhaps way more than you bargained for. When looking for pet rabbits for sale, be very wary if you find a pet rabbit that has a wet nose together with matted fur on the inside of the front legs, or if it or its siblings or mother have white snot in the nose. Please, please just thank the pet owner graciously for his time, and then leave immediately without buying a single rabbit. These rabbits are sick with pasteurella, also called snuffles, a sickness that cannot be cured. You can only tame it temporarily with drugs. If you let up on the drugs and the vet trips, the rabbit will get sick all over again. It's just not worth it. Animals have the right to welfare, but not an innate right to life. (They're prey animals, after all.) If your rabbit is chronically ill and feeling miserable, it is an ethical choice to euthanize it humanely. you need to start out with healthy rabbits. Find tips and easy suggestions for finding pet rabbits for sale in your area, at our Rabbits For Sale page. This page also offers rabbits for sale listings by State. Some of the breeders listed will have pet rabbits for sale.